Translated as the ‘Spanish’ sauce, Espagnole is a rich-bodied brown sauce. The sauce is the base of many other sauces, but perhaps most popularly, the demi-glace. Demi-glace is a time-consuming super-concentrated sauce popular in restaurant dishes. 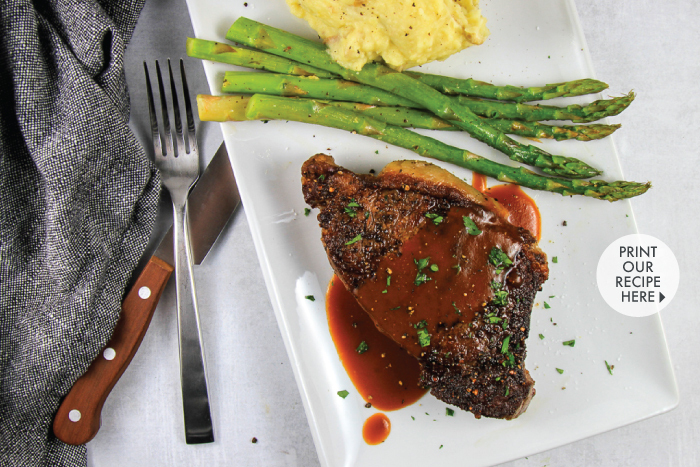 Using a less-traditional, quicker recipe, we served this Espagnole sauce directly on a seared steak for an enhanced savory flavor in each bite! 1. In a saucier or saucepan, melt the butter and sauté the onion, carrot, and celery until the onion is translucent. 2. Sprinkle the sautéed vegetables with flour, and stir to form a roux. Let the roux become browned, but monitor carefully to avoid scorching or burning. 3. Once the roux has a nutty smell and is a darker brown, add the beef stock, tomato puree, peppercorns, bay leaf, parsley, and thyme. 4. Simmer the sauce for about 20-30 minutes or until it has thickened and reduced by about one-third. 5. Skim off any excess fats or oils that have risen to the surface. 6. Strain the sauce using a fine mesh strainer to remove the solids. 7. Serve the brown sauce as is, or refine it further into a demi-glace or red wine sauce. Freeze any excess Espagnole sauce in an airtight container, and use within one month.